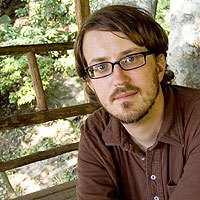 Alex Beckstead is a San Francisco-based documentary filmmaker. Paperback Dreams is his second ITVS-funded project. The first, Trailer Park Blues, is an honest but sensitive portrait of his grandfather's lifelong struggle with alcoholism in a trailer park north of Phoenix, AZ. Beckstead also produced segments in Kenya and Uganda for the 2005 PBS special Ending Aids: The Search for a Vaccine. This one-hour documentary tells the story of one of the greatest medical challenges of our time: finding a vaccine to prevent HIV/AIDS. His other credits include being the associate producer of Muhammad: Legacy of A Prophet, a two-hour prime time PBS special that was both a biography of Islam's founding prophet and a profile of contemporary American Muslims. He also directed a companion documentary for a DVD release of the HBO dramatic series Deadwood. Beckstead's first film, a short documentary called SXE, screened at the 1999 Sundance Film Festival.